A key determining factor of the safety and productivity of any deli department is the condition of its equipment. Operation, safety, and sanitation inspections provide advance notice of potential equipment problems and necessary corrective actions. KASCO is dedicated to helping maximize the efficiency of your deli operation not just by reducing equipment downtime, but by ensuring that equipment is running safely and efficiently in an environment free of machine operation safety concerns. KASCO offers a variety of comprehensive preventative maintenance programs from fully trained service professionals that can also provide quick and efficient repair services to reduce expensive equipment downtime. Contact your local KASCO representative for more information. KASCO provides maintenance and repair on the top brands in the industry. Our fully trained service professionals have experience with Hobart, Bizerba, Berkel, Globe and other food equipment brands. These technicians ensure your deli equipment is running properly for maximum efficiency. 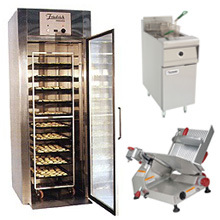 Hobart manufactures products for the foodservice and food retail industry, including cooking, food preparation, warewashers and waste handling, weigh wrap, Baxter baking and Traulsen refrigeration. From national food service chains to local delis, Globe's line of slicers, mixers, scales, choppers and countertop cooking equipment is hard at work delivering the precision that creates beautiful food and healthy bottom line results.